CHANCE OF FLARES: Sunspot AR1560 has more than quadrupled in size since August 30th, and now the fast growing active region is directly facing our planet: movie. NOAA forecasters estimate a 40% chance of M-class solar fares during the next 48 hours. Solar Flare alerts: text, phone. 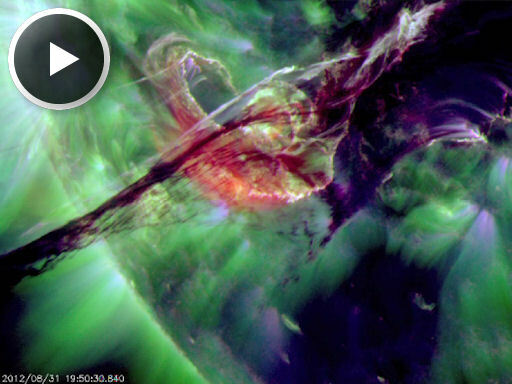 The explosion hurled a CME away from the sun traveling faster than 500 km/s (1.1 million mph). The cloud, shown here, is not heading directly toward Earth, but it could deliver a glancing blow to our planet's magnetic field on or about September 3rd. This date is preliminary and may be changed in response to more data from coronagraphs on the Solar and Heliospheric Observatory (SOHO). Stay tuned. On September 1, 2012 there were 1330 potentially hazardous asteroids.